This image shows an artist’s impression of glycolaldehyde molecules, showing glycolaldehyde’s molecular structure (C2H4O2). Carbon atoms are shown as grey, oxygen atoms as red, and hydrogen atoms as white. Glycolaldehyde is a simplest form of sugar that can be found. The molecules of glycolaldehyde are smaller than the sugar used in food and drink (sucrose). The molecular formula for this compound is C2H4O2. Glycolaldehyde forms from many precursors, including the amino acid glycine. Glycine is a precursor to proteins which are essential to the formation of life. The NASA spacecraft Stardust confirmed the presence of glycine in comet Wild 2 which strengthened the theory that compounds required for life to flourish are present throughout the universe. Glycolaldehyde has been detected in outer space twice; in 2000 in a gas cloud and within a star forming region in 2008. A team of astronomers using the Atacama Large Millimeter/submillimeter Array (ALMA) has spotted sugar molecules in the gas surrounding a young Sun-like star. This is the first time sugar been found in space around such a star, and the discovery shows that the building blocks of life are in the right place, at the right time, to be included in planets forming around the star. The astronomers found molecules of glycolaldehyde — a simple form of sugar  — in the gas surrounding a young binary star, with similar mass to the Sun, called IRAS 16293-2422. 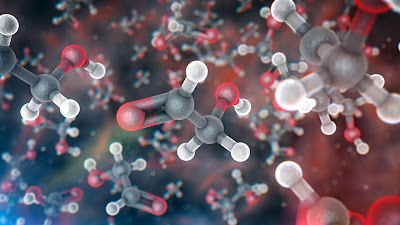 Glycolaldehyde has been seen in interstellar space before , but this is the first time it has been found so near to a Sun-like star, at distances comparable to the distance of Uranus from the Sun in the Solar System. This discovery shows that some of the chemical compounds needed for life existed in this system at the time of planet formation . A team of astronomers has found molecules of glycolaldehyde -- a simple form of sugar -- in the gas surrounding a young binary star, with similar mass to the Sun, called IRAS 16293-2422. This is the first time sugar been found in space around such a star, and the discovery shows that the building blocks of life are in the right place, at the right time, to be included in planets forming around the star. The astronomers used the Atacama Large Millimeter/submillimeter Array (ALMA) to detect the molecules. This image shows the Rho Ophiuchi star-forming region in infrared light, as seen by NASA’s Wide-field Infrared Explorer (WISE). IRAS 16293-2422 is the red object in the centre of the small square. The inset image is an artist’s impression of glycolaldehyde molecules, showing glycolaldehyde’s molecular structure (C2H4O2). Carbon atoms are shown as grey, oxygen atoms as red, and hydrogen atoms as white. In the WISE infrared image of Rho Ophiuchi, blue and cyan represent light emitted at wavelengths of 3.4 and 4.6 micrometres, which is predominantly from stars. 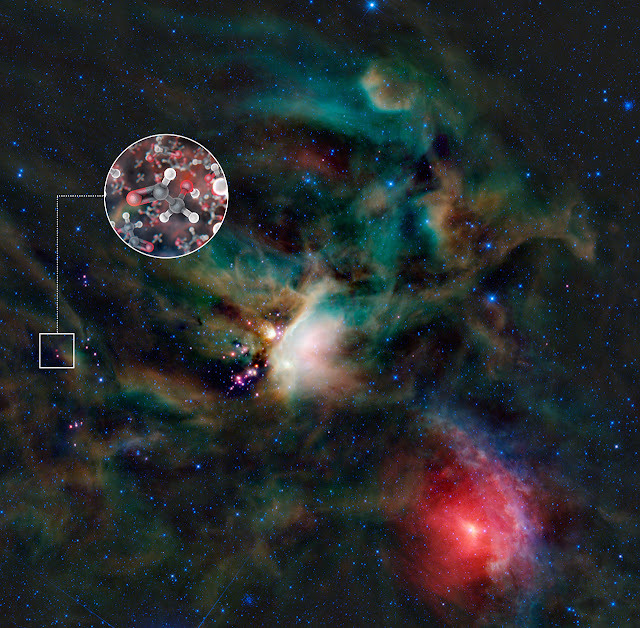 Green and red represent light from 12 and 22 micrometres, respectively, which is mostly emitted by dust. The high sensitivity of ALMA — even at the technically challenging shortest wavelengths at which it operates — was critical for these observations, which were made with a partial array of antennas during the observatory’s Science Verification phase . The gas and dust clouds that collapse to form new stars are extremely cold  and many gases solidify as ice on the particles of dust where they then bond together and form more complex molecules. But once a star has been formed in the middle of a rotating cloud of gas and dust, it heats the inner parts of the cloud to around room temperature, evaporating the chemically complex molecules, and forming gases that emit their characteristic radiation as radio waves that can be mapped using powerful radio telescopes such as ALMA. IRAS 16293-2422 is located around 400 light-years away, comparatively close to Earth, which makes it an excellent target for astronomers studying the molecules and chemistry around young stars. By harnessing the power of a new generation of telescopes such as ALMA, astronomers now have the opportunity to study fine details within the gas and dust clouds that are forming planetary systems. "A big question is: how complex can these molecules become before they are incorporated into new planets? This could tell us something about how life might arise elsewhere, and ALMA observations are going to be vital to unravel this mystery,” concludes Jes Jørgensen. The work is described in a paper to appear in the journal Astrophysical Journal Letters. Sugar is the common name for a range of small carbohydrates (molecules containing carbon, hydrogen and oxygen, typically with a hydrogen:oxygen atomic ratio of 2:1, as in water). Glycolaldehyde has the chemical formula C2H4O2. The sugar commonly used in food and drink is sucrose, which is a larger molecule than glycolaldehyde, and another example of this set of compounds. Glycolaldehyde has been detected in two places in space so far — first towards the Galactic Centre cloud Sgr B2, using the National Science Foundation's (NSF) 12 Meter Telescope at Kitt Peak (USA) in 2000, and with the NSF's Robert C. Byrd Green Bank Telescope (also USA) in 2004, and in the high-mass hot molecular core G31.41+0.31 using the IRAM Plateau de Bure Interferometer (France) in 2008. Accurate laboratory measurements of the characteristic wavelengths of radio waves emitted by glycolaldehyde were critical for the team’s identification of the molecule in space. In addition to the glycolaldehyde, IRAS 16293-2422 is also known to harbour a number of other complex organic molecules, including ethylene glycol, methyl formate and ethanol. Early scientific observations with a partial array of antennas began in 2011 (see eso1137). Both before and after this, a range of Science Verification observations have been performed to demonstrate that ALMA is capable of producing data of the required quality, and the data produced have been made publicly available. The results described here use some of these Science Verification data. Construction of ALMA will be completed in 2013, when 66 high-precision antennas will be fully operational. They are usually around 10 degrees above absolute zero: about –263 degrees Celsius. This research was presented in a paper “Detection of the simplest sugar, glycolaldehyde, in a solar-type protostar with ALMA”, by Jørgensen et al., to appear in Astrophysical Journal Letters.